The Wilfrid Laurier University women’s hockey team earned every bit of their 3-0 win at home against the Brock Badgers on Sunday night. Coming off Saturday’s 4-1 loss to Guelph, the Hawks were looking to get back in the win column against a 1-14-4 Brock unit that sits dead last in the Ontario University Athletics standings. After a slow first period where both teams struggled to find scoring chances of much value, the club grinded their way through the Badger defence in the second frame and attacked the net with vigor. “That’s the only you can win in this league. If you play on the perimeter, there’s too many teams with good goaltending and good inside out defensive play that you just won’t score enough goals to win,” said head coach Rick Osborne. The offence was lead by a goal and two assists by third-year Robyn DeGagne. DeGagne was thrown into unfamiliar waters early in the game when Osborne placed her on a new line in an effort to generate production. “I think playing with [Tammy] Freiburger and [Jessie] Hurrell … they’re really going right now. I’ve never played wing alongside them so to get that opportunity, I knew I had to step it up and create something,” said DeGagne. “Those are our smartest, our best and our hardest working players and they’re the ones I trust the most right now,” Osborne added. Thanks to staunch Golden Hawk defence, first-year goalie Nicholle Kovach had a relatively uneventful night between the posts. However, 17 saves was enough to capture her second OUA shutout. “It was nice to get the shutout. Especially towards the end, Brock really started picking it up a lot, and they were getting a lot of opportunities so especially those last five minutes, finally when the buzzer rang it was a huge relief,” said Kovach. “We’ve had a really long process throughout this entire season,” she added. Kovach also attested to the difficulties presented by a sleepy night in net. By going 1-1 on the weekend, the Golden Hawks now sit at 12-5-4 on the year. This places them fifth in the OUA standings, firmly in playoff position. With just three games left on the 2014-15 schedule, the focus of the Golden Hawks has now shifted to the postseason. They now have to play on without captain Laura Brooker, as she fills that same role on Canada’s World Universiade Games team in Granada, Spain.According to Osborne, the team will look to veterans on the roster to fill the hole left by Brooker. “I’m really looking at players like Prevette, I’m looking at Meigs. I’m looking at Platt and those players. Last year not all of them were playoff warriors and this year I would like to have more of a critical mass at playoff time” he said. 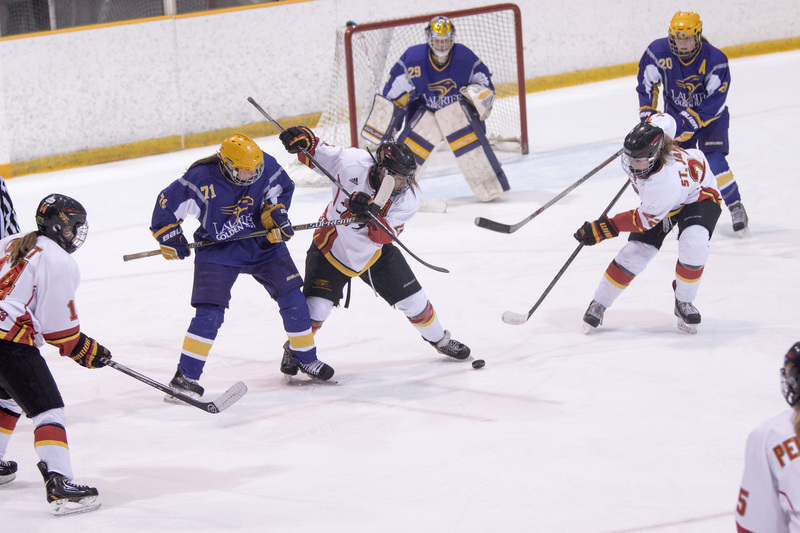 With the season winding down, the Golden Hawks will travel to Kingston to play the Queen’s Golden Gaels on Feb. 7 in a rematch of last year’s OUA championship. The game is their third to last of the regular season before the Hawks start to get tuned up for playoff hockey.